Halfwits offering uninformed opinions on classic movies. I only recently came across this podcast but became automatically hooked as they cover a plethora of underground, underrated, & esoteric cinema. Much like the similar Monster Kid Radio, B-Movie Cast discusses & dissects movies yet I really love that they go beyond just vintage horror & science fiction films but also cover old school action films as well. Extremely entertaining stuff for sure. RIP Vince Rotolo. I've been meaning to write a review of the B-Movie Cast for years but I never seemed to be able to find the time but now that Vince Rotolo, the creator of the podcast, has unexpectedly passed away I had to write something. The B-Movie Cast is without a doubt the most fun podcast out there! Vince is a genuinley nice man who has great passion for those movies that are slightly off kilter! Vince, his wife Mary and cohosts Nic and Juan gave me something that I truly looked forward to week after week! You will be missed Vince!!! This is THE podcast for B-movie fans. Such a fun, knowledgeable group of podcasters that have a real love of all the B-movies that you know and love. Vince, Nick, Juan and Mary, Hi Mary👋 definitely on my favorites list. This is a great podcast for any b-movie fan . The podcast is very funny . Thanks to B-movie podcast I have learned of and watch some Bad and great movies ..A must listen to for any movie fan . Thanks for the show and keep up the great job .. This is a truly great podcast. Vince, Mary, Nick, Juan and a cast of guests discuss the obscure, the wacky, and some of the best B-movies out there. Every week its something new, sometimes familiar and sometimes weird, but always enjoyable. I take these guys with me every day, and enjoy their conversations and reviews. If you enjoy good bad movies, then this is the podcast for you. I stumbled upon this podcast by randomly clicking on it, looking for podcasts focusing on all things cult. What a wonderful surprise to find such a wonderful group of movie fans who have something to love about every movie they watch. Well...almost. If you like all things b-movie, then Vince, Mary, Juan, Nick and the rest of the clubhouse gang are just for you! So grab a TV tray full of your favorite junk foods, sit back and enjoy! Great cast, real people who genuinely love b movies (and one "normie" to keep it in perspective. ;) ) A real family vibe, and a good mix. Never miss it. i listen to this during work sorting mail at the post office at 0400am. I laugh out loud at times! You can tell it's very much a podcast that's just a continuation of an on-going covnersation about movies these folks have all been having all of their lives, and that's what makes it fun to listen to. I’ve been meaning to write a review of the B-Movie Cast for a while. I’ve listened to Vince, Mary, Nick, Juan, and their assorted cast of ne’er-do-wells for the past few years. It’s my favorite podcast. Each episode feels like you are discussing movies with a group of friends and not with a bunch of know-it-alls looking to score points in some hipster argument. None of their critiques is ever cruel for the sake of being cruel. They actually try to find a redeeming character in even the B-est of B-movies. I like that evenhandedness. The group offers a wide range of B-movies up for discussion, from Manos to Under the Skin. They are always looking to expand their own knowledge of the various genres and also looking to share that knowledge with their listeners. Prizes are given away, emails are shared, phone messages are played, stories and jokes are told…it almost has the feel, at times, of an old variety show or local radio show! If you love B-movies — and moreover, if you love talking about B-movies from a fan’s perspective — then you should really enjoy this podcast. Thanks to Vince and the Gang at B-Movie cast for reminding me of some forgotten classics and turning me on to gonzo flicks like Starcrash and Curse of the Doll People. Often the cast reminds me of my youthful viewing of Creature Double feature or Commander USA. I especially like Juan’s Mexican horror choices and Nick’s plot breakdowns ( how he does it I don’t know), and of course I can’t forget…. Hi Mary!!! Let me say that a few years ago I went to a horror convention and I heard about this show. Once I got around to looking it up and listening to an episode I liked it. Now it is my favorite podcast. Are there slicker productions out there? Sure. Are there more knowledgeable cinephiles out there? Of course. Is there a better mixture of chemistry between the hosts or more out and out joy in the making of a podcast? Absolutely not! Listening to this podcast is like putting on your favorite, most comfortable shoes. They manage to eviscerate cinematic turkeys without a hint of vitriol or mean- spiritedness. I enjoy listening to them a lot. If you get a chance, listen to it. I do not think that you will be disappointed! I was looking around for another podcast to enjoy, when I came upon this one. I love this show. When I start listening I really feel like im in a room listening to a bunch of friends talking about B-movies. Keep up the good work. I think I found one of my top podcasts. Thanks for the fun an laughs. I love the B Cast podcast because it soothes the inner monster kid in me. I would hope young and old horror fans could listen to B Cast but if not I think the older horror fans will be comfortable with Vince and company. I also like B Cast because everyone sounds like a bunch of old friends talking about movies and now I have some new friends to listen too. Best Podcast on B Movies! The B-Movie Cast is not only an informative & highly entertaining podcast, but a rich community of people who enjoy weird films from around the world. I highly recommend this podcast to those of you who are seeking unusual films. Best Horror/Sci-fi Podcast on the web! The B-movie crew are the best podcast for horror and sci-fi movies anywhere on the internet. Good, insightful talk about all things B-Movies (horror, sci-fi, westerns, etc.). Vince, Nic, Mary, Juan, and all of the other guest hosts, bring something different to the table that makes it so diverse. Thanks for keeping it clean, too! The Best Podcast on B-Movies, period. I've listened to Vince Rotolo and the B-Movie gang for over a year now. If you're looking for bookish, overly didactic film analysis, then continue your search. The B-Movie Cast is a fun group of people who put on no pretense whatsoever. Their genuine love for the 30s, 40s, 50s, and 60s sci-fi/horror schmaltz is as infectious as it is informative. It's just about the only podcast that I listen to each week, without excpetion. Highly recommended!!!!! I've enjoyed the casual conversations between Vince, Mary and Nick for a couple of years. It's clear that the hosts love B-Movies and they relay a lot of information about them. Nick gives a nice recap of the plot and Vince delivers facts about the cast and crew. This is not the slickest, overly produced podcast out there, but the way it's presented actually fits the genre it represents almost perfectly. I never miss Vince, Mary and Nick - Endlessly entertaining and informative. a great little b-movie film community! i've listened to every episode of the B-Movie Cast and i totally enjoy it! Vince, Mary, Nic, Juan and all the other characters who contribute their love and knowledge to the show make this program a real delight. not only that...the show has really become a community of b-movie lovers. i've had the pleasure of meeting the cast and other b-movie fans several times at Monsterbash in Pennsylvania. its a real joy hanging out with the crew and talking b-movies over food and drink. Long Live the B-Movie Cast!!!!! A smart and friendly crew. I'm addicted. Sometimes I'll wait to watch the topic movie until after the podcast other times I'm searching out titles I've already seen to get their opinions. A knowledgable group whose main goal seems to be to point you in the direction of movies you haven't seen before, and to laugh, respectfully, for the ones you've seen and love. Great job. Keep it up! Great great - better than chocolate cake! I listen to a LOT of podcasts - I have a long daily commute and the podcasts keep me going. Vince, Mary, Nic and Juan are now old friends and theirs is the first podcast I listen to each week. I'm a member of the Facebook fan page and love all things B-Moviecast. I do love the movies, but the conversation is golden - it's like sitting in your living room, kicking back and visiting with good friends. Keep up the good work guys - I have miles to go before I sleep . . . ! If you like going to conventions or sitting around with your friends and listening to them talk about great old movies, this podcast is for you! Very little foul language, friendly, funny hosts, great info, suggestions, fabulous feedback. These guys love their listeners and it shows. Great contests too, cool prizes. If you are a genre fan, check this out, you won't regret it!!! Fun, informative and always entertaining, The B Movie Cast covers a variety of films, including sci fi, action, horror and more. No matter how bad you might think the film is, the crew in the B Movie playhouse makes one remember why these films are such fun. Every podcast fan should add this to their collection.... Hmmm, I mean queue. I'd spent a good while looking for a podcast that loves these movies as much as I do, and this is the one I recommend. Yes, there are other shows that talk about B-movies, but few as lovingly as this one. Plus, B-Movie Cast doesn't seem as averse to made-for-TV movies, which I also genuinely love. Great movies discussed with very likable people. You can tell they enjoy what they are doing. The B-Movie Cast is one of the best podcast out there for classic horror and scifi. Give it a try. You will not be disappointed! I enjoy how Vince presents a look at the b-movie world. And his wife sounds lovely. Nick is always amusing. BUT....Juan's voice is so annoying! And on my I-pod, his mike is always hot, so he comes on SO LOUD, especially compared to low-key Vince. Otherwise, enjoy the sound clips and thoughts. I listen every week. Why can't Vince say “Star”? Vince what is Stawbucks? The rest of the planet says "Star” bucks. When you go into the coffee shop don't they make you pronounce it correctly? 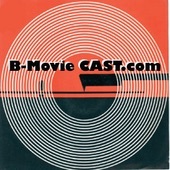 The B-Movie Cast is what a podcast should be like … a weekly gathering of friends [young and young-at-heart] talking, laughing, and loving B-Movies of all kinds! If you're new to listening this or any podcast, the crew of the B-Movie podcast are warm, friendly people who welcome one and all to the podcast. There's nothing fake or phony about them. They are what other podcasts strive to be and sometimes fail. This podcast is nothing but pure gold even though some of the movies reviewed may not. Each film is spoken of in a way that may give you reason to try them out … or again whatever the case might be. not your typical movie review podcast and that's why i like this show.the hosts and their guests are fun to listen to.recommend! The B Movie Cast has a fun, likeable group of b-movie fans discussing the wide range of horror, exploitation, sci-fi and other film oddities often grouped together under the heading "B-Movies". It really is like joining in a discussion of these films with other affable b-movie fiends. Will definitely be listening to more! I've been going through a bit of a 60s and 70s horror kick, and it's great to look up old episodes from films I've seen. Love the show guys. It is refreshing to hear a laid back podcast about some great and not so great films of the past. Keep up the great work. You guys are great! Keep up the great job. I am loving the Thing from another world retrospective. Can't wait to see what you guys say about John Carpenter's Classic. B-movie cast is an entertaining and professional-quality podcast! I enjoy listening to the whole cast of characters. Great movie selection! I am a big Bmovie fan and happened to stumble across Vince's podcast a few weeks ago. Should have left a review earlier but I have been too busy listening to the huge library of casts that Vince and crew have put out to date. WOW I love this cast!! Vince along with co-host Nic and sometimes Mary do a great job with these episodes. It's nice to listen to someone folks with a real appreciation for these old flicks etc. Great movies, good production values, contests you can't lose. LISTEN NOW!!!!!! Thank for taking the time to review these wonderful and not so wonderful movies that i used to see on late night weekend TV. The chemistry between the hosts and the various guest hosts is great and entertaining. Well worth the time to regain the love of these B movies. Great podcast about vintage sci-fi and horror films! I have to say, this is one of my very favorite podcasts, film-related or otherwise. Each week, host Vince Rotolo and his wife Mary are joined by trusty co-host Nic Brown (and a whole slew of revolving guest panelists including the astonishing "Juan from the creepy swamps of South Florida" and the seemingly superhuman "Richard from Wichita") to discuss a sci-fi or horror film from the not-so-distant past. Generally, the films under review are from the 1950s and 1960s -- the golden age of the American drive-in theater -- but the show has tackled films of both older and newer vintage. Think: monsters, mad scientists, robots, and rocketships. The show's typical format is to focus each episode on one movie in particular, so there's plenty of time for a discussion of the plot and characters as well as background on the cast and crew. The tone of the show is relaxed and genial, knowledgeable but friendly. Production values are excellent, and episodes of the podcast typically feature kitschy old commercials and songs to help complete the nostalgic mood. The B-Movie Cast is what I'd call a great "hang out" show, in that you feel like you are hanging out with great bunch of guys and gals for a couple of hours as they shoot the breeze about some of the weirdest and wildest movies ever made. Bottom line, this is a lot of fun and really helps pass the time. I'm lost without the BMC on Mondays! I found this podcast by accident in May of last year while searching for podcasts that were horror, cult, sci-fi, b-movie related. There are a lot of podcasts about this subject, and I've listened to a lot of them, and continue to try new ones, but the B-Movie Cast is by far the best I've listened to. Vince, with his wife Mary and co-host Nic seem like down to earth, really nice people who obviously love the subject they talk about. Nic gives a great synopsis of each film that is discussed and never sounds like he's sitting in front of his computer reading off of IMDB like so many other podcasters obviously do. They have also turned me onto films I never thought I would watch. There are a handful of guest co-hosts that join Vince, Nic, and Mary that are very knowledgeable, entertaining and bring something different to each show. Even the listeners that leave voice mail have become familiar and I enjoy what they have to say each week. They all know a hell of a lot about the subject, but don't pretend to know everything. There is no attitude, no hipster fanboys trying to be funny or shock you with tons of profanity. It's a real nice community Vince is putting together and it's something I look forward to listening to each week. Keep up the good work.